Spirit Animals is the next series in Scholastic's multi-author, multi-platform, multimedia book series for middle graders, along with The 39 Clues and The Infinity Ring. I haven't had any experience with the other two series, so I don't know how this one holds up to those two, but when I saw this book available at ALA earlier this year, I thought I'd give it a chance. I was actually pleasantly surprised by Brandon Mull's world building. He doesn't waste much time before we are thrown directly into the story and are given history to the character's world and mythology right away. In the world of Erdas, when a child turns 11, they are given Nectar to see if they can call a spirit animal to them. Not every child calls a spirit animal, and it is never known which animal they will call. The spirit animals become a companion to the child and they learn to work together, the child gaining some more than natural ability that is attributed to what their spirit animal is. When the animal is dormant, it becomes a tattoo on the person that it is bound to. Four children from around the world (very deliberately multi-cultural, and very PC with 2 boys and 2 girls) each are given Nectar and they then each call one of the Four Fallen great animals of legend. It has been prophesied by a member of the Greencloaks (those in charge of protecting the Nectar and Erdas) that these four children were going to call on the great animals because their world is endangered as the Devourer, a great evil from the past, has also returned. What follows from here is a fast paced adventure where the children must take on their first challenge and learn to work together with both themselves and their spirit animals. I really think this series will be a hit with both boys and girls, as Mull does a great job of portraying the kids in the book realistically, showing that kids can be smart and strong, but at that age, they still have insecurities to get over, and that it's OK to have those insecurities because their still young. I think the fantasy elements will go over well with kids, as they are portrayed as grand in scope, but not overwhelming, so I think a younger audience will really go for this. I'm sure the online interactivity will also be a big draw for kids. You will be able to go online and create a character and call on a spirit animal and it looks like you'll be able to play online games and check in with other friends who are playing as well. Like I said before, since I've not had any experience with Scholastic's other books that tie in with an online element for kids, I can't really give much more information than this, but I'm assuming they are doing well, as this is the third such series that Scholastic is putting out. I'll be picking up the next book to see how the continuing authors carry on with the groundwork that Mull has set. The next book in the series, which if the cover is anything to go on deals with the wolf spirit animals, is written by Maggie Steifvater, who is no stranger to wolf-based fiction with her Shiver Trilogy for young adults. That book will be released in January, 2014. 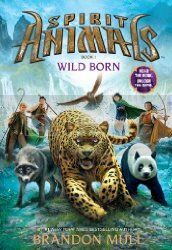 You can pick up a copy of Spirit Animals, Book 1: Wild Born by Brandon Mull from Scholastic on September 10, 2013, at your favorite bookstore!